True, the 'Merc with a Mouth' was created by Fabian Nicieza and Rob Liefeld, but the book that took him right out of first gear, straight up through second to sixth and beyond Thunderdome wasn't The New Mutants, X-Force or his series of mini-series'. 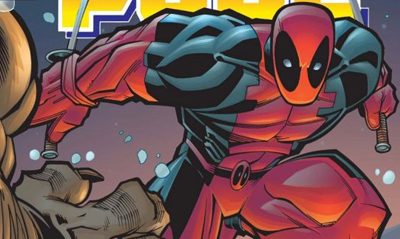 It was Deadpool Vol 1 by artist Ed McGuinness and writer Joe Kelly. 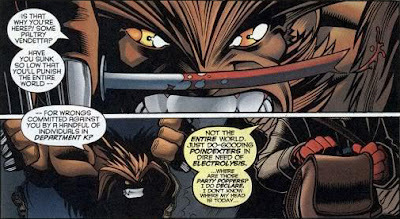 I wonder what debates roared around Marvel, as they gave one of their most Image looking gun and pouch carriers over to a non-Liefeld clone like Ed McGuiness. Whoever had the final say should've gotten one hell of a raise. Ed’s clean manga focussed layouts gave Deadpool it's own trademark look, different to any other of his trigger-happy 90's contemporaries. Plus, even hardest of all, Ed matched in pencils the crazy plots and humour writer Joe Kelly layed down in words. Revving the adventure stakes to crazy unpredictable twist-filled highs, Kelly 'wrote' Wade's character voice so clearly, you’d swear he had him strapped to the chair beside him as he typed. Fresh one-liners that not only cracked you up long before 'L.O.L.' was a famous acronym, it made a deeply flawed character with a hamburger face Marvel’s new comedy king, in place of that web-spinner who at the time swung under the title 'used to be a laugh'. Anti-Peter Parker must’ve been a favourite theme of Joe's in writing Deadpool. Wade's love/hate relationship with Blind Al played off Pete’s iconic relationship with his Aunt May. Similarly, Al pushed Deadpool to be a better person when he wasn't sure he could be one and looked almost identical to Spidey's infamous octagenerian. Then there were the guest stars. I mean what book launches with Sasquatch from Alpha Flight, Taskmaster and The Hulk? As Wade used his inner monolouge to outwit the galactic plans of Landau, Luckman and Lake, the 'genius' creative pairing sadly split after just nine awesomely crazy, black humour laced issues. While Ed has rarely come across Deadpool since, Joe continued on, playing off plot threads he and Ed had hidden and building the superb love triangle of sorts between Deadpool, Typhoid Mary and Daredevil. While Marvel NOW wouldn't be hated if it reunited this pair for a second run on the second Deadpool title of the initiative, if Deadpool's ever made you smirk in the slightest way, you should probably backtrack and see these issues first. It’s a guaranteed wise-cracking, trigger-loaded good time. What did you think of Joe and Ed on Deadpool? I still have my early issues of this run myself. It was damn good for its time, and still holds up today. Like you said, it set the standard for the how the character of Deadpool acts and talks nowadays. Who knew huh? Because I'm pretty sure as good a writer as Joe Kelly was perceived even back then, that Marvel might not have had super big hopes on this book, and Deadpool himself, doing as well as it did. Yeah - I almost wish Kelly got a share of the character's royalties he did so much for Deadpool. Oh well, I guess that's another argument for creator owned comics! Very nice. The best Deadpool run, IMHO. We need a TPB of this. "relationship with Blind Al played off Pete’s iconic relationship with his Aunt May"
Hey Doggma - welcome to IADW! We do need a trade you're right. And if Siryn is MJ, does that make Typhoid Felicia Hardy/Black Cat? After all it is unlucky to cross her path too!